Spring Fed Records has announced its recent digitisation of ten old-timey records that were previously unavailable online. These releases are now available for free streaming or digital download for $9.99. Titles uploaded include works from: J.T. Perkins, W.L. Gregory & Clyde Davenport, The Perry County Music Makers, Sam McGee & Bill Lowery, The North Fork Rounders, Clayton McMichen, Frazier Moss, Fiddlin’ Doc Roberts, Nor- man Edwards, Vernon Solomon, The Missouri Corn Dodgers, a super-group consisted of a combination of artists including J.T. Perkins and Roy Crawford, and a compilation of fiddlers from the Tennessee Valley. All artists added are originally from Davis Unlimited Records, a deceased label that sold it’s catalog to the Arts Center in 2003. In addition, Spring Fed has added the second volume of their affordable Cream of the Crop compilation series. Cream of the Crop was released with the goal of bringing music-lovers the best of the Spring Fed catalog for a low, attainable price. Five dollars will get you over twenty-five songs of wonderful, old- timey Southern music. Volume I is available here. Volume II is available here. Spring Fed Records is the music production program of the Arts Center of Cannon County, a non-profit arts organization in the small, rural town of Woodbury in Middle Tennessee. Begun in 2002, Spring Fed Records has grown quickly, producing critically acclaimed CD releases every year. Spring Fed produces only the finest old-time, bluegrass, blues and traditional gospel recordings as well as reissuing significant historical musical recordings. 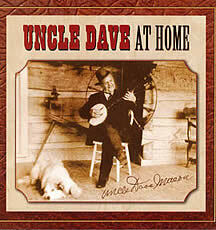 Another project from the Spring Fed collection is by artist Uncle Dave Macon called Uncle Dave At Home is a CD project funded by the Tennessee Arts Commission with the hope of introducing a whole new audience and perhaps a whole new generation to the music of Uncle Dave Macon. Born in Warren County, Tennessee in 1870, Macon started his career by playing for family and friends and later helped found the Grand Ole Opry. “The Dixie Dewdrop” became a full-time entertainer in 1920 at the age of 50. Uncle Dave died just weeks after his last performance at 81. The CD features Uncle Dave Macon at his most relaxed and authentic, sitting before his own fireplace on a warm spring Sunday afternoon in Kittrell, Tennessee, halfway between Murfreesboro and Woodbury. The recordings in this CD are informal, amateur recordings made on a portable tape recorder. They were made circa May 1950, a little over a year before Uncle Dave’s death. Improvements were made during the transfer from tape to CD. Digital mastering was performed at the Center for Popular Music at Middle Tennessee State University.